Since its 2006 peak, when the inmate population was more than double the system's intended capacity, the ranks have dropped considerably. But prisons throughout the state are still woefully overcrowded, with stuffed cells and spillover inmates housed in make-shift bunk rooms. 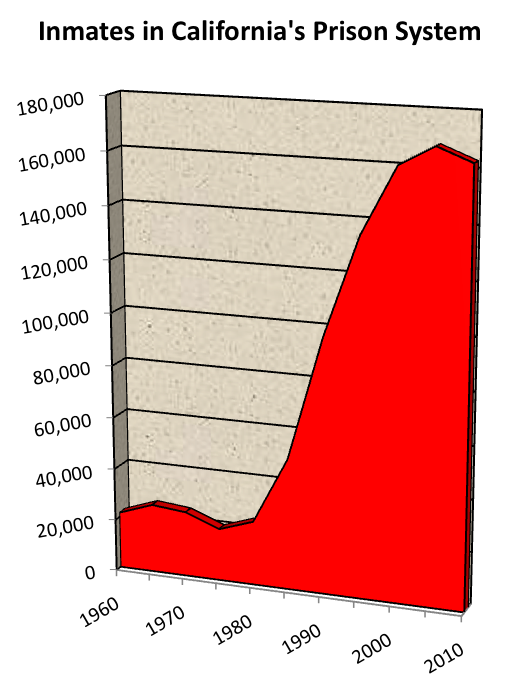 The graph on the right – looks like a scary ski slope – shows the increase in California's inmate population since 1960. Note the relatively steady levels until 1980 (even though California's general population more than doubled during that period). And then all of a sudden ... BOOM! Things explode. 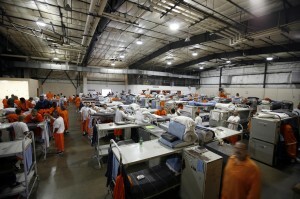 Between 1977 and 2007 the crime rate fell and the general didn't even double, but California built almost 20 prisons, just about tripling the number of its facilities. Meanwhile, the prison population increased by more than 800 percent. Until recently, the state spent about $10 billion a year on prison, or roughly 11 percent of its total budget. That's than what goes to the University of California and California State University systems combined. In 2009–10, the average cost to incarcerate a prisoner in California was nearly $47,000 (security and inmate health care accounted for about three–quarters of that). To put that in perspective: California spends, on average, less than $9,000 per-student on k-12 public education. California can now claim the country's most expensive prison system with the highest rate recidivism (inmates who return to prison after release).